We are one of the leading manufacturers and exporters of SW – 2491212. Our product range is widely used in various industries as per their application and also as an interior decoration item. These products are treasured for their quality features and other characteristics. Clients can avail these products at economical prices. 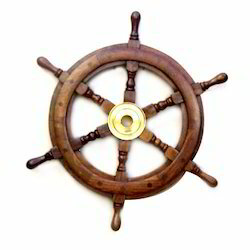 With a firm commitment to quality, we are involved in offering a wide ambit of Antique Wooden Round Wheel. Our Wooden Ship Wheels are made from very high quality raw material which ensures durability. These wooden ship wheels are available in market at very competitive prices. These ship wheels are highly appreciated all over the globe for their long lasting luster, easy mount, robust construction, graceful design and rust resistance finish. We require inquiries in bulk. 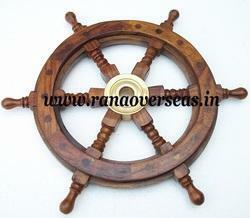 This Ship Wheel Is 15 Inches In Diameter And Is Crafted From Genuine Sheesham Wood. It Is Made Using Dowel Pins And Is Extremely Sturdy. It Has A Lovely Antique Finish And Makes A Lovely Addition To Any Nautical Collection. tem description: beautifully crafted by very talented artist of india. Wood Carving Konark Wheel, Size/dimension: 4"
We are successfully engaged in providing a wide gamut of Brass Center Wooden Ship Wheel.